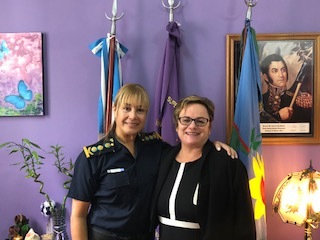 Professor Kerry Carrington with Liliana Pienda Superintendent of Women’s Police, Ministry of Security, Province Buenos Aries. Professor Kerry Carrington has just returned from Argentina where she is researching women’s police stations (Comisarias de Mujer) with Partner Investigator – Professor Máximo Sozzo Universidad Nacional del Litoral, Santa Fe, Argentina. The field research has involved interviewing officers who work at these special women’s police stations (WPS). The research team includes – Natacha Guala Research Assistant, Maria Victoria Puyol HDR student, Professor Diego Zysman a Senior Research Associate from the Faculty of Law, Universidad de Buenos Aries. The research has been funded by an ARC Discovery Grant and will report is outcomes in both Spanish and English. Women’s only police stations emerged historically at a time of re-democratisation in Latin America. They were designed to enhance women’s confidence in the criminal justice system, encourage reporting, prevent re-victimization, and send a message to the community that gendered violence was no longer tolerated and men who abuse women will be made accountable. Brazil was the first country in Latin America to establish women’s only police stations in 1985. Since then, women’s police stations have been established in Argentina, Bolivia, Brazil, Ecuador, Nicaragua, Peru, and Uruguay, and more recently in Sierra Leone, India, Ghana, India, Kosovo, Liberia, the Philippines, South Africa and Uganda. A 2011 United Nations Women evaluation found that women only police stations in Latin America enhanced women’s access to justice and their willingness to report, increased the likelihood of conviction, and enlarged access to a range of other services such as counselling, health, legal, financial and social support. Of those surveyed for the evaluation, 77% in Brazil, 77% in Nicaragua, 64% in Ecuador and 57% in Peru felt that women only police stations had reduced violence against women in their countries (Jubb et al 2010). A recent study of WPS in Brazil used female homicides as a proxy measure for assessing their effectiveness. They compared 2074 municipalities from 2004 to 2009 and found that ‘women’s police stations appear to be highly effective among young women living in metropolitan areas’ . The homicide rate dropped by 17 per cent for all women, but for women aged 15-24 in metropolitan areas the reduction was 50 per cent (or 5.57 deaths reduction per 100,000) (Perova and Reynolds 2017: 193-194). 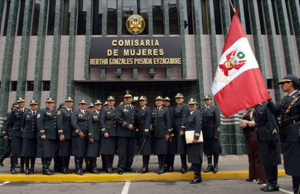 The province of Buenos Aries currently has 138 women’s police stations employing around 2300 officers. The first one was established at La Plata in 1988. They are designed to address, respond and prevent gendered violence. WPS are hybrid agencies, partly funded by provincial, local barrio, government and community organisations. In Buenos Aires, WPS are commonly located in brightly painted houses that provide a holistic range of services including child care, transport, counselling, legal, social support and comfort. They do not remotely resemble police stations as commonly conceived. Social workers, lawyers and health professionals work in an integrated response team with officers from the WPS to assist victims of gendered violence. The stations have a mandate to prevent gendered violence through grass roots community level primary interventions, local activism, forging partnerships, running local campaigns, and producing informative material for public dissemination. Their effectiveness in preventing gendered violence and the identification of what elements might transfer to other countries has never been studied. Professor Kerry Carrington was awarded an ARC Discovery Grant (2018-2020) to study the prevention of gendered violence. As part of that study she will be studying the preventative impact of Women’s Police Stations in Argentina with Partner Investigator – Professor Máximo Sozzo Universidad Nacional de Litoral, Santa Fe, Argentina. 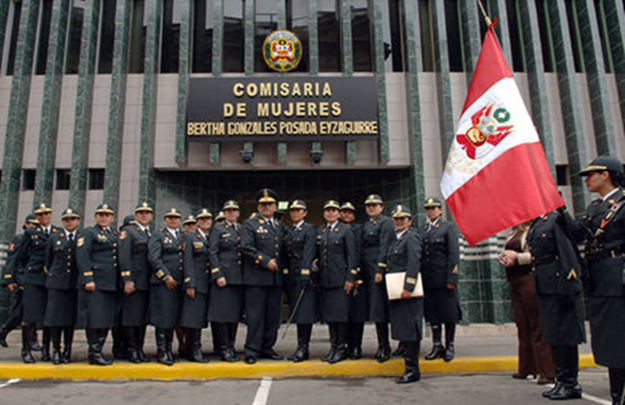 The Buenos Aries province of Argentina has 138 Women’s Police Stations that employ over 2300 personnel. Little is known in the English speaking academy about how societies in the global s outh have approached the prevention of gendered violence. Brazil was the first country in Latin America to establish women’s only police stations in 1985. 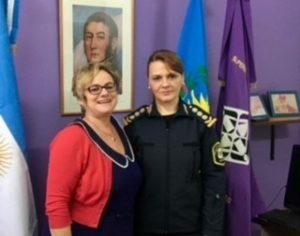 Since then, women’s police stations have been established in Argentina, Bolivia, Brazil, Ecuador, Nicaragua, Peru, and Uruguay, and more recently in Sierra Leone, India, Ghana, India, Kosovo, Liberia, the Philippines, South Africa and Uganda. A 2011 United Nations Women evaluation found that women only police stations in Latin America enhanced women’s access to justice and their willingness to report, increased the likelihood of conviction, and enlarged access to a range of other services such as counselling, health, legal, financial and social support. Of those surveyed for the evaluation, 77% in Brazil, 77% in Nicaragua, 64% in Ecuador and 57% in Peru felt that women only police stations had reduced violence against women in their countries (Jubb et al 2010). Women’s only police stations emerged historically at a time of re-democratisation in Latin America. They were designed to enhance women’s confidence in the criminal justice system, encourage reporting, prevent re-victimization, and send a message to the community that gendered violence was no longer tolerated and men who abuse women will be made accountable. A more recent study of WPS in Brazil used female homicides as a proxy measure for assessing their effectiveness. They compared 2074 municipalities from 2004 to 2009 and found that ‘women’s police stations appear to be highly effective among young women living in metropolitan areas’ . The homicide rate dropped by 17 per cent for all women, but for women aged 15-24 in metropolitan areas the reduction was 50 per cent (or 5.57 deaths reduction per 100,000) (Perova and Reynolds 2017: 193-194). Kerry now has all the approvals necessary to conduct the research and will commence in July this year. You can listen to a broadcast about the research project aired Friday afternoon 27 April 2018 on the Multicultural Show – Community Radio Interview 4EB by clicking the link below.